This post contains affiliate links. By clicking a link and buying something, I might earn a small commission at no extra cost to you. As an Amazon Associate I earn from qualifying purchases. For additional details click here. 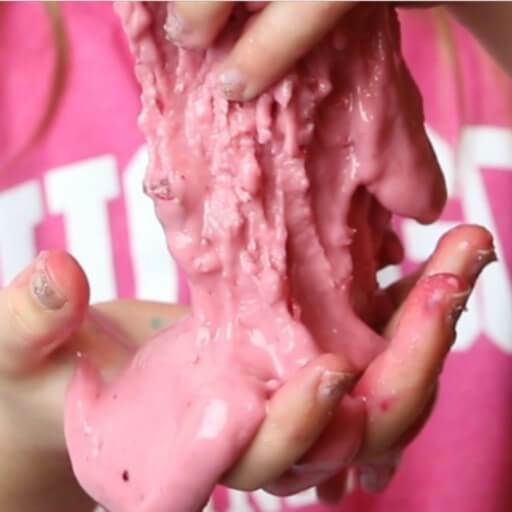 Odds are high that if you have kids they’ve asked for slime. My nieces and nephews love the stuff – I’m pretty sure one of them even had a slime themed birthday party. It seems like plenty of moms have made slime to hand out as party favours, and I bet they would have loved to use these edible slime recipes! Much as my three year old loves playing at sensory activities, she sometimes she still puts things in her mouth, especially if the thing she’s playing with looks tasty. There’s a reason we call her Monkey! Fortunately, I came across a recipe for edible slime. 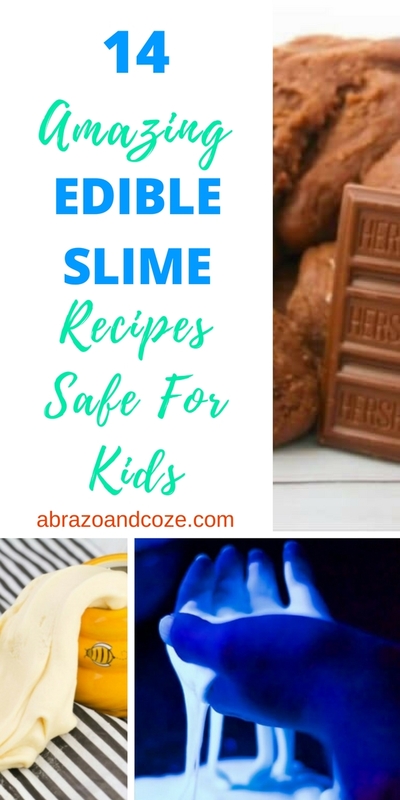 Since I know I can’t be the only parent out there whose kids would love to play with slime but who just don’t want to have to hover and stress over keeping the littles safe I collected these edible slime recipes. All of them are pretty easy to make with very few ingredients. They’re safe to taste, and though a few might not actually taste really great, many of them will be a hit simply because they’re basically slime candy. That said, whether or not they would taste good wasn’t the criteria I used to add them to this curated list of edible slime recipes. If they were safe to taste and I had confidence that with some low-key supervision they wouldn’t pose a hazard to my kids or yours, the recipe made the list. Of course, you know your children best, and I know nothing of their medical history, allergies, sensitivities, or developmental level. Therefore, use your judgement to decide if these recipes will work for your family. Now, on to the good stuff. Let’s check out all these great edible slime recipes. Chocolate slime to the rescue! Depending on their abilities, and your motivation (and your willingness to deal with the mess that inevitably happens with little helpers), you can make some chocolate slime, with or without the help of your darlings. 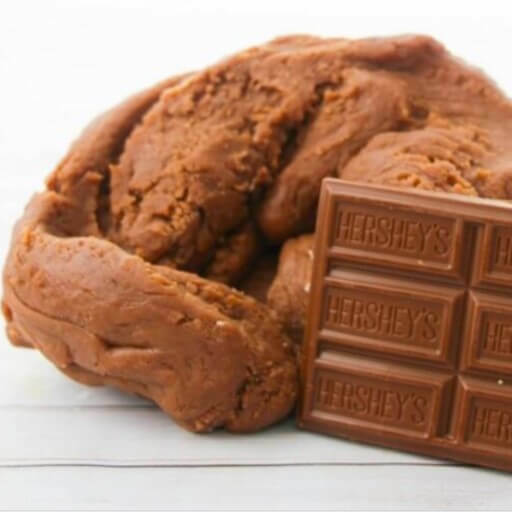 Once the kids are happily occupied playing with their chocolate slime, you can take advantage of the diversion and enjoy your own sweet treat. Pop over to Little Bins For Little Hands for the directions. One of the perks of this edible slime recipe is the versatility. Depending which flavour of pudding you choose you’ll get a different pastel colour and a variety of delicious scents (and tastes, should it end up being nibbled on by curious youngsters). If you’re feeling especially ambitious, you could make up several different flavours and let the kids mix them into a pretty marbled effect. If you want to make it extra special, add in some sugar confetti and you could have slime to match the nearest holiday (heart confetti for Valentine’s Day or stars with red and blue sprinkles for USA Independence Day, for instance). Visit The Soccer Mom Blog for the recipe. When you’re feeling adventurous, gather up a variety of gummy types, round up the children, and do some science. Note the colour change between plain gummy bears and opaque gummies (my local bulk store sells pink and white gummy Dracula teeth that are fun to play with, and opaque green frog gummy candies). Is there a change in flavour if you use sour gummies? Any texture change if you use sugar dusted gummy candies? If you try out those experiments let me know the results in the comments. Click over to In The Kids Kitchen to try out this edible slime recipe. Laffy Taffy is one of those candies I don’t often see for sale except at the dollar store and during “confectionary holidays” (you know those holidays when the seasonal section at the stores get filled with candy – Halloween, Valentine’s Day, Easter, etc). Stop by Teach Beside Me to grab the directions. If your kids enjoy funfetti birthday cake, this is the best of these edible slime recipes. It turns regular edible marshmallow slime into a colourful birthday cake flavoured slime. For variety, add some different sprinkles or tiny coloured sugar pearls. If you want to be extravagant, you can add in edible gold colouring for an elegant gold shimmer. I bet a royal or pirate themed birthday party would dazzle with gold slime! Watch the video tutorial from Shundara Castion and let me know what you think. Rainbows and unicorns are quite trendy these days, and if you love all those bright colours, you’ll delight in edible Kool-Aid slime. 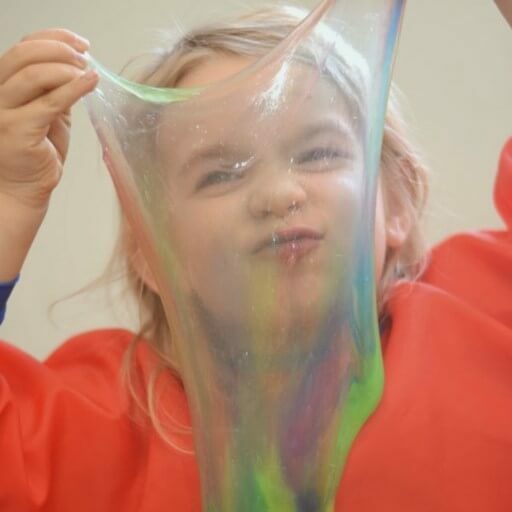 Make a few batches, each with a different colour, then let the kids twist and stretch them together to make a really fun rainbow slime. Although you can make the recipe without the drink crystals, what fun is that? By using the Kool-Aid, you’ll be able to skip the flavour oil and food colouring that the plain recipe calls for. I bet some edible glitter would look dazzling with this edible slime! You can find the step by step directions at Growing a Jeweled Rose. If you want a easy edible slime recipe that even your youngest toddlers can help make, edible applesauce slime is perfect for you. 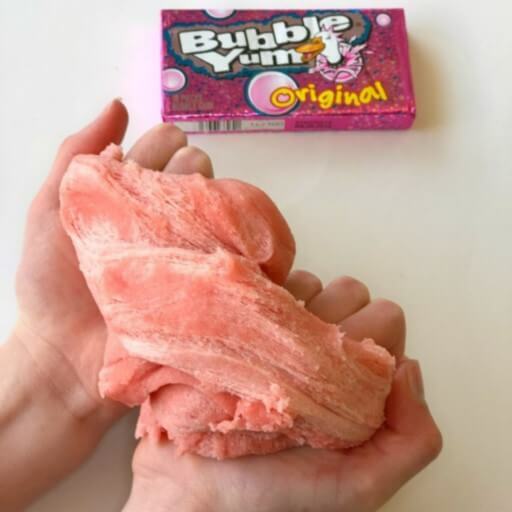 With only two common ingredients, you’ll be able to whip up a batch of this edible slime on a whim. The youngest children often want to help in the kitchen. They desperately want to do what their big sisters and brothers are doing. Let them help. It might get a little messy. (OK, I’m kidding nobody with that statement… undoubtedly it will get messy!) But it’ll be worth it to watch and help your little ones succeed in making a “big kid” craft. Your little darlings will be happily amused for at least long enough to get some chores done… or relax! Always Out Numbered provides a super-easy to follow tutorial. I love honey. I love how it tastes, and I love how it smells. When fresh honey gets those little crystals starting to grow in it, I still love it. I might be a little odd… I embrace my weirdness. 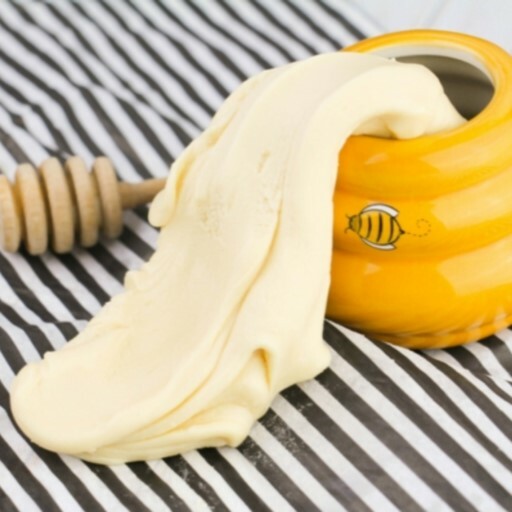 But it’s my love of honey that prompted me to include this edible slime recipe. Furthermore, I am certain you (and your children) will enjoy playing with this sweet scented slime. Out of all the edible slime recipes, I think you’ll find this to be the “healthiest”, if you don’t prefer the food colouring or processed sugar in some of the others. Due to their age, however, children under one year old shouldn’t play with this edible slime. There’s a small risk of botulism from honey (even if it’s pasteurized) for the youngest sensory seekers. Their immune systems just aren’t as fully developed as an older child. Sugar Spice and Glitter outlines the steps to make this slime recipe. 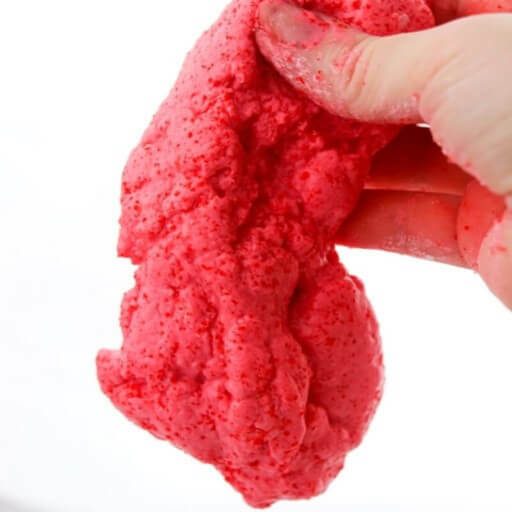 If your children love bubblegum, they’ll have a blast with this edible slime recipe. 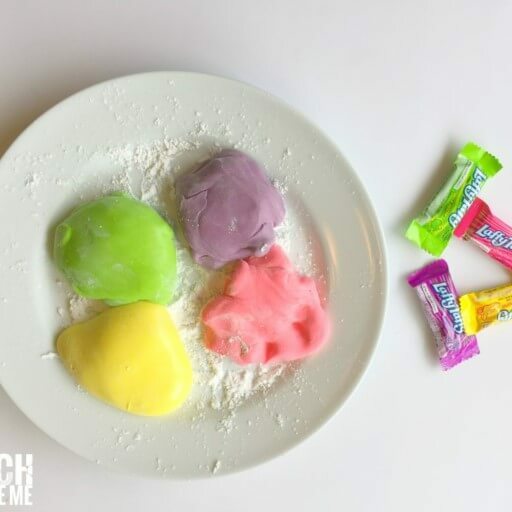 The only two ingredients are bubblegum and coconut oil… I don’t know who comes up with these slime recipes to start with, but I have to give them props for creativity! I imagine it would be especially neat to use a few different flavours. Perhaps another fun rainbow result in the end? Let me know how it goes if you try the idea. Find the recipe at Teach Beside Me. This edible slime recipe is sure to get all the ooohs and aaahs. 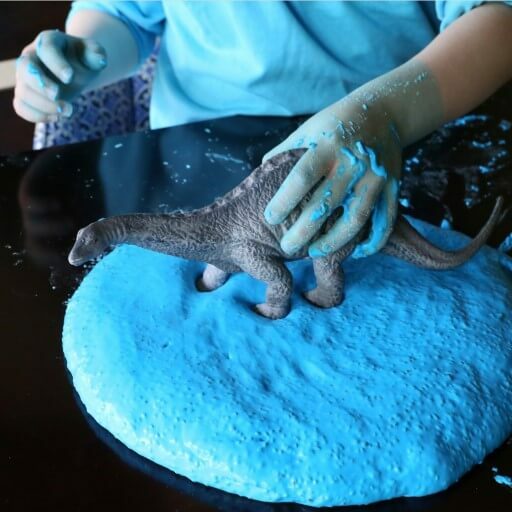 You’ll be elevated to “cool parent” status after making this slime recipe that glows under black light. My eldest two kids have both been super-excited when visiting a glow in the dark event (like glow in the dark bowling or mini putt). (My little Mountain Goat hasn’t yet had the opportunity.) There’s just such a magical feeling to see ordinary things glowing in the dark. And with such easy access to black lights (I can buy bulbs at the dollar store), it’s an exciting opportunity to experience at home. 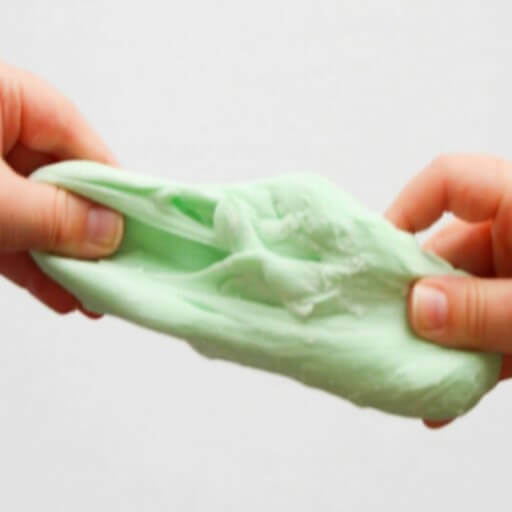 The Soccer Mom Blog explains exactly how to create this edible slime recipe. 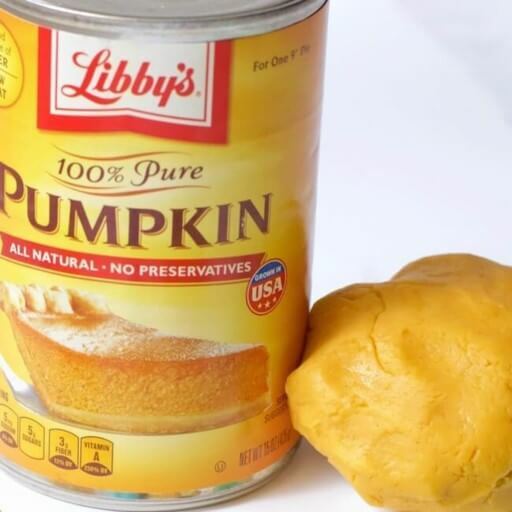 This edible slime recipe is great for cool autumn days when pumpkin spice starts getting added to everything. Additionally, slime is a super indoor activity for cool fall days or rainy days year-round. Once your kiddos have exhausted their creativity and need a recharge, consider storytime. After a story or two, they’ll be recharged and ready for more crafty fun. The Soccer Mom Blog is a slime genius. Find the directions for many edible slime recipes at that site, including this one. When winter rolls around, and the snow starts falling, I like to find fun indoor activities. This edible cranberry slime is perfect for those frosty days when you just don’t want to get everyone dressed for the outdoors. If your family is anything like mine, you finally get everyone bundled and outside only to have one need to pee and then the other starts crying because the snow is cold and they keep removing mittens to touch it… sigh. This is the slime recipe to make on days like that. Sugar Spice and Glitter will show you the way. 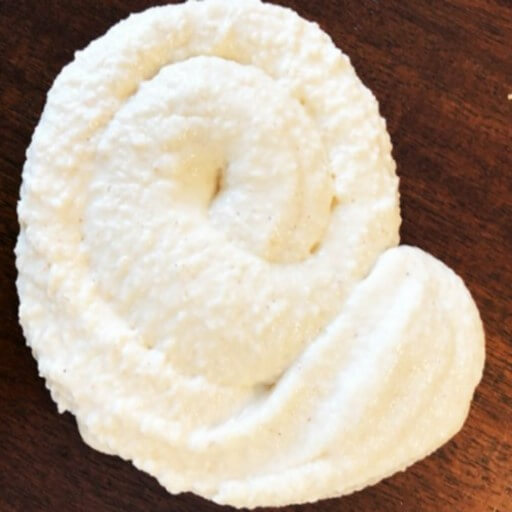 If you’re looking for an easy, no-cook edible slime recipe, you’ll be happy to learn there are three right here to choose from: chia seed slime, flax seed slime, and seed free slime. Take your pick, or try all three. Be sure to plan in advance to make this edible slime because the seeds need to soak several hours beforehand. While you’re waiting, try a different craft. Fun at Home With Kids provides all three recipes. Jello comes in so many colourful options, I’d be tempted to make another rainbow slime. (If you haven’t figured it out yet, I’m a rainbow fan!) If I’m going to the trouble of making one batch, it’s hardly any extra effort to make a few batches. 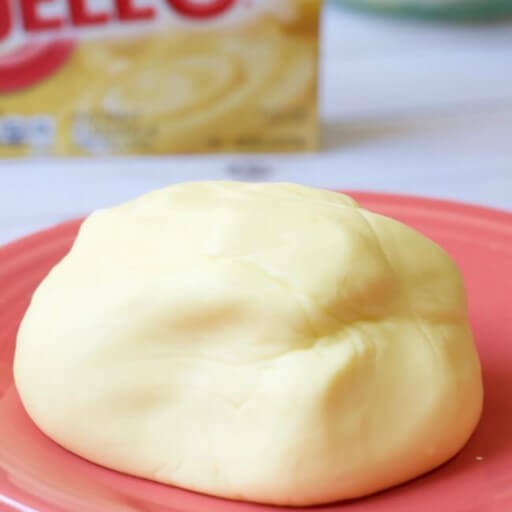 Of all the edible slime recipes, I think Jello slime has the best potential for adding bits to spruce it up. Mix in some mini candies, or perhaps a few bright candy confetti. Kids are bound to have hours of fun whatever you add in. All those little bumps and pops of colour just add to the experience. Little Bins for Little Hands will show you the way . 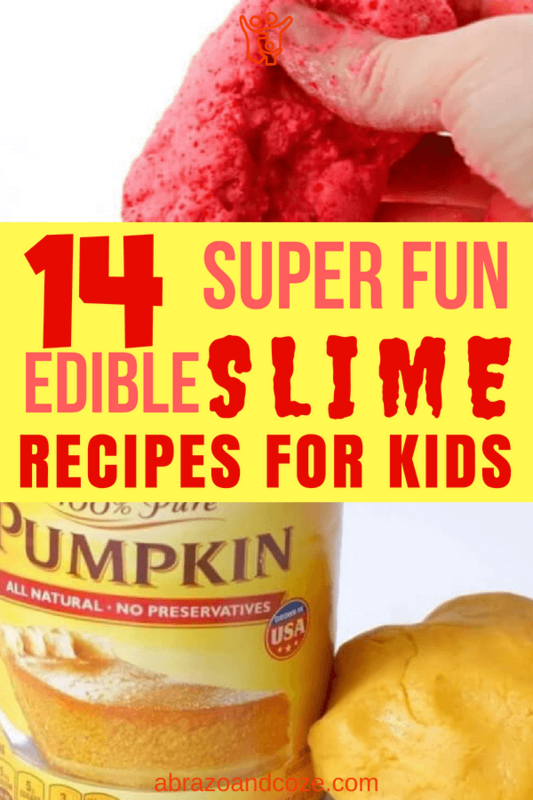 No matter which of these edible slime recipes you choose to make, your children will have hours of fun. 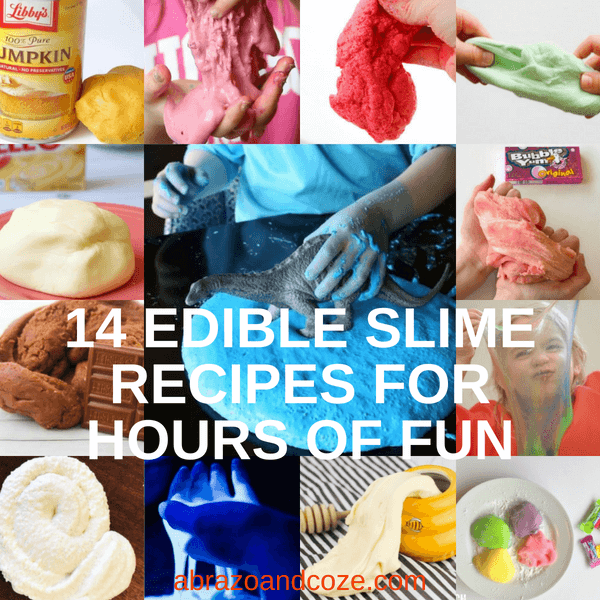 There are enough edible slime recipes to make one every three to four weeks without any repeats. Finally, a quick note about storage. Because these are edible, that also means they’re perishable. You’ll need to store them in an air tight container in the fridge between uses. Also note, you should discard after a week at most. Clearly, if it looks or smells off, toss it straight away. I’d hate for little tummies to be upset from spoiled slime. Let me know in the comments which recipes you’re planning to try. I also want to know which edible slime recipe make your favourites list! I love the chocolate one. It tastes sooo good and is cool to play with. Glad you like it! I like that one, too!! Marvelous, what a web site it is! I love these slime recipes!! Glad you love the recipes! I hope you found them as interesting as I did. I’ve made slime before but never edible slime! I want to make the chocolate version! I think this is a really great idea. I think the chocolate is my favourite! This is so so helpful! I’m a youth worker and my teenagers love slime but a lot of the activators aren’t easily available in the UK or are just so full of chemicals etc- love these ideas and feel so much safer knowing they’re natural enough to eat! Thanks so much for sharing! So glad you find it useful! I image the teens will have fun trying out the different recipes, and seeing how they compare in texture, stretch, and maybe even taste!